*Healthy Workplace Film Award DOK LEIPZIG! "It's time to wake up and smell the imported roses." "Part poetry, part explosive exposÃƒÂ©." The roses we enjoy may come with more thorns than we realize. Delving deep into the heart of the global flower industry, A BLOOMING BUSINESS shows us the difficult reality behind the pretty flowers. In Kenya, giant flower factories use massive amounts of pesticides and chemicals to keep their flowers alive and then pollute the local water supply, harming the very same people they employ. A revealing investigation into the horrific working conditions and sexual abuse that the workers must endure in order to keep their job. 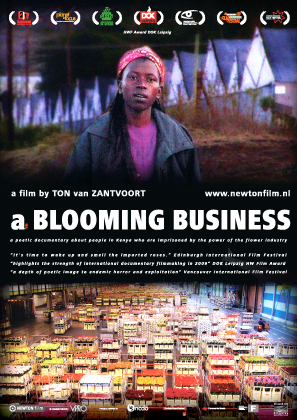 A BLOOMING BUSINESS explores the human and environmental repercussions of the floral industry. A rose may no longer smell as sweet. Ton van Zantvoort is an independent filmmaker and takes the initiative to produce a film in accordance with his own interest. His way of producing seems to be connected with direct cinema; direct observations with minimum external interference and control over virtually the entire process of making a film. However, in Ton's films, you will notice that the preference lies in styling and emphasizing the layout of image and sound. This makes the work original and bears witness, content wise, to the enormous will power of the maker. Throughout his films, Ton consciously lays down his statement, through which he creates his own vision of reality. The vision of a western civilized person who makes us do some soul searching. Some confronting soul searching, yet making it a process you want to endure as long as possible.